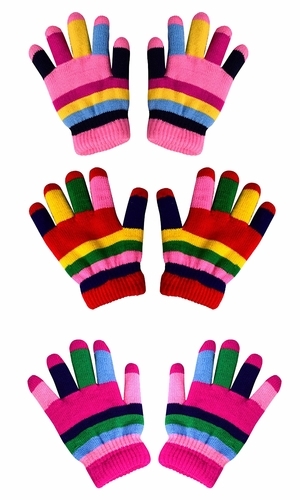 These vibrant color striped kids gloves come in an assorted pack of 3 for warm hands all winter long. These are a surprise pack of colors. Available in rainbow, neutral stripes, and solid colors. Keep your little one warm with these value pack of gloves. Comes in a set of three to match any outfit. Perfectly warm and snug for the winter ski season. Plenty of colors and variations to choose from. Fits Ages: 4-6 years. 100% Acrylic.